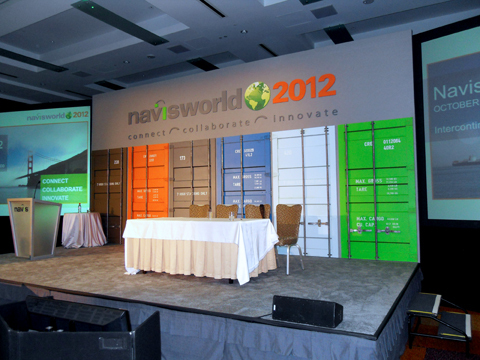 NAVIS World 2012 — John Murray Productions, Inc.
NAVIS is the global technology standard for managing the movement of cargo through terminals, and their biennial conference was held at the Intercontinental Hotel in San Francisco. John Murray Productions, Inc. worked with PS Communications to create the set for their conference, whose theme was 'Connect, Collaborate, Innovate', and whose goal was to bring together customers, partners, and employees of the shipping operations company. The set featured six custom built panels, designed to look like the back doors of cargo containers, complete with authentic hardware and labeling. The swinging center panel was used as a creative entrance to the stage for keynote speakers. The event's logo, cut from 1/2" foamboard and painted in our shop, finished the look by accenting the space above the cargo doors. 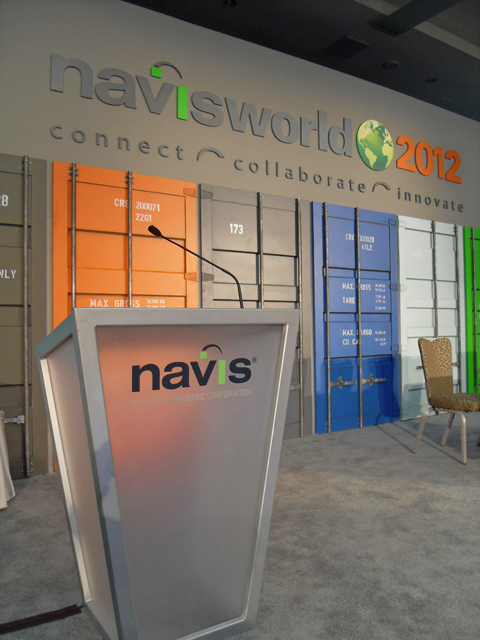 The overall effect was professional, with a touch of industrial grit, creating the perfect backdrop for the transportation logistics company to thank their guests for their continuing support of NAVIS.